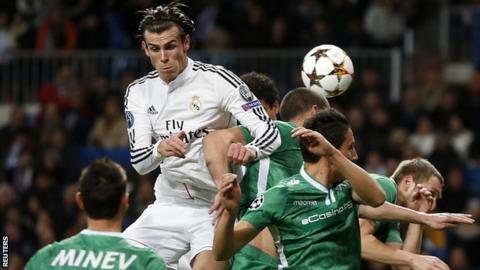 Real Madrid coach Carlo Ancelotti has praised his "extraordinary" team after they set a new Spanish record of 19 straight wins by defeating Ludogorets Razgrad 4-0 in the Champions League. The holders became the first team to maintain a 100% record in the Champions League group stages on two occasions. "I know that I have an extraordinary group of players," said Ancelotti. "The results have been achieved by hard work and an incredible amount of professionalism." Cristiano Ronaldo and Gareth Bale were both among the scorers on Tuesday as Real passed the mark set by bitter rivals Barcelona, who won 18 straight games in the 2005-06 campaign under Frank Rijkaard. European champions Real are now just five victories away from equalling the world record of 24 consecutive wins set by Brazilian side Coritiba FC in 2011. The European champions are also now unbeaten in 20 Champions League home games, a record which goes back to April 2011. Real are the only team to have won all of their group matches in this year's Champions League - they previously achieved the feat in 2011, when current Chelsea boss Jose Mourinho was in charge. Only six teams have ever finished the group stages with a 100% record. "The relationship with my players is very good," added Ancelotti, whose side are two points clear of Barcelona at the top of the Spanish league. "They are very important to me and I take every opportunity I can to thank them. "Our present situation can only come about if all components come together. I have felt a lot of support from the club also in September when things were not going well for us."